The Rock Island Grand Prix has announced that this year’s open shifter King of the Street race sponsored by MG Tires will honor the memory of former Superkarts! USA executive Jim Murley who died earlier this year of cancer. Rock Island will also continue to race in memory of local karter and multiple Rock Island champion Travis DeVriendt who died in 2015. “It would also be awesome if some of the competitors who raced with Jim during those years would return to help us honor him – even if just to race in Masters, the Ignite arrive-and-drive program, or just share a few words,” said Ruthhart. Only 10 driers have worn the cape and crown as champion of King of the Streets. It was originally created as an event that would circulate among various temporary venues. The 1998 event at the Oklahoma City Grand Prix was won by Joe Janowski. In 1999 Alan Rudolph won at Quincy in the Park. From that point, the race has had a permanent home at the Rock Island Grand Prix and become one of the most coveted titles in kart racing. 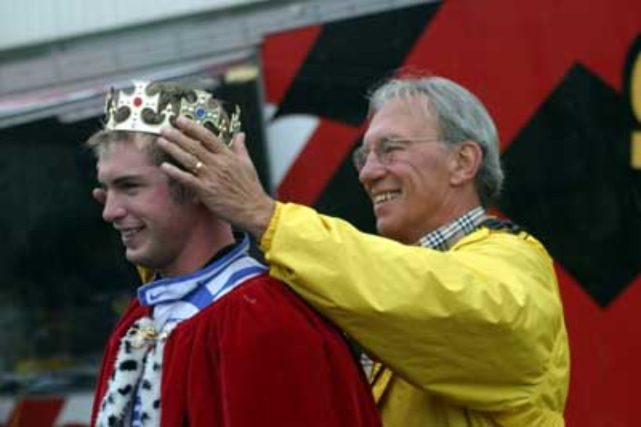 Alan Rudolph won the crown five times (1999, 2000, 2001, 2006 & 2007) and Jordon Musser won it four (2009, 2010, 2012 & 2013). It has also been won by Scott Speed (2002), Bobby Wilson (2003), Kyle Wiegand (2004 & 2005), Alex Speed (2008), Derek Crockett (2011), Connor Iseli (2014) and Josh Lane last year. Mr. Murley, 74, of Worthington, Ohio, died Feb. 22. He was an avid race fan and began his racing career on dirt bikes, hotrods, boats and sprint cars. Once again this year, the Briggs & Stratton LO 206 Heavy class will be run as the Travis “Turbo” DeVriendt Memorial Race. Mr. DeVriendt, who raced at the Rock Island Grand Prix for 12 years and was a four-time winner, became a victim of suicide early in 2015. The Grand Prix committee wants to continue to work with his family to use the tragedy to raise awareness about suicide in young adults. Some of last year’s race proceeds were donated to the National Suicide Prevention Assn.